Leave everything you thought you knew about Sports Touring behind with the Supercharged Ninja H2 SX. Surge across continents, along autobahns and through mountain passes. Go further faster on our most capable Sports Tourer yet. Ninja H2 SX – SUPERCHARGE YOUR JOURNEY. Three years after Kawasaki introduced the unique forced induction Ninja H2 and Ninja H2R, Kawasaki now introduces a new Supercharged motorcycle featuring the 2nd generation balanced supercharged engine; the Ninja H2 SX. The excitement and characteristic power delivery of a 200ps supercharged engine is now brought to the Sport Tourer category, making the new Ninja H2 SX the ultimate Sport Tourer. The Ninja H2 and the Ninja H2R were born from a pure pursuit of performance and created to offer riders an unforgettable experience; the new Ninja H2 SX explores a different direction, that of Sports Touring. Balanced Supercharged technology has been developed entirely in-house by Kawasaki with a focus on real-world street use, offering a sensational linear power output in the low-mid range combined with excellent fuel efficiency, the latter proven to be even better than the Sport Touring sibling Z1000SX. This specially tuned engine character suits long-distance riding, while being capable of delivering the exhilarating acceleration feel that only a Kawasaki supercharged engine can provide. Thanks to its light weight, the Ninja H2 SX has a striking power-to-weight ratio while the sporty riding position, superb ride comfort, reassuring high-speed stability and agile handling all contribute to the touring aspect of the Supercharged Sport Tourer. To complete the picture, the Ninja H2 SX features much advanced technology and electronic rider aids such as Kawasaki’s latest IMU-equipped electronics package, cruise control, Kawasaki Cornering Management Function and many more. Moreover, Ninja H2 SX riders will be able to share their experience with a passenger thanks to a highly revised Ninja H2-derived trellis frame that is equipped to carry a formidable 190kg payload. Kawasaki engineers made sure that riders can still make use of the supercharged engine when riding with passenger or panniers by developing this new rigid chassis with a longer wheelbase and an altered steering angle that ensures stability and confidence at high speeds. The all new Ninja H2 SX comes in two model variants: the standard Ninja H2 SX and the Ninja H2 SX SE Focused as being ultimate in class the SE model comes equipped with an impressive array of additional quality features such as Kawasaki’s first TFT LCD meter, lean angle sensitive LED cornering lights and a quick shifter for seamless up and down gear selection. Leave everything you thought you knew about sports touring behind with the supercharged Ninja H2 SX. Surge across continents, along autobahns and through mountain passes. Go further, go faster. 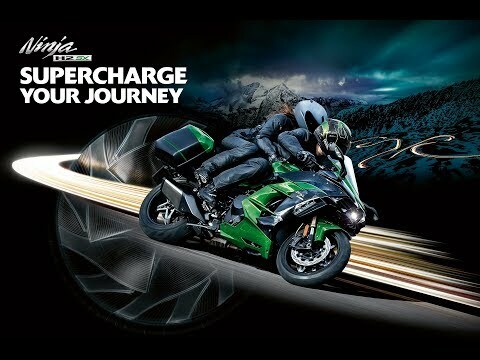 Ninja H2 SX – Supercharge Your Journey.